X-Large Bird Toys for Cockatoo and Macaw Size Birds "Senior"
Finding the perfect bird toy for your Umbrella Cockatoo, Moluccan Cockatoo, Blue and Gold Macaw, Green Wing Macaw, Scarlet Macaw, Hyacinth Macaw and all similar sized birds is not an easy thing to do. More than even the smaller parrots, these large feathered friends just love to play, chew and destroy bird toys. At FunTime Birdy our extra large bird toys are made with love and care right here in the U.S.A. and only the safest of all bird safe materials are used. 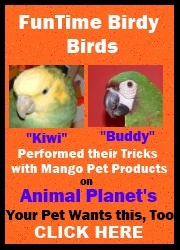 All FunTime Birdy bird toys are bird tested and bird approved so your parrot will have the ultimate playing experience. If your extra large parrot loves to chew wood bird toys, plastic bird toys, shreddable bird toys or even loves foraging bird toys....FunTime Birdy has the right bird toy choice for your bird.